This week’s callers spotted my error in the last edition in thinking we were looking at a shot from the Bermuda College, as it is actually the Technical Institute (as was the previous week’s photo). The photo itself was labelled 1980s, but Dawson Swan said that this may have been because it was used in a 1980’s brochure for continuing classes. I am grateful to Dawson Swan, Tyrone Williams, George Courtney Jr, Edwin Mortimer and Tracey-Lynn Salaam, who put the pieces together for last week’s archive image. Edwin Mortimer said “The teacher on the right is my old friend Harold Molyneaux; a much respected teacher, originally from Montreal, Canada.” The class he is teaching appears to be either metalwork or mechanical/electrical engineering. 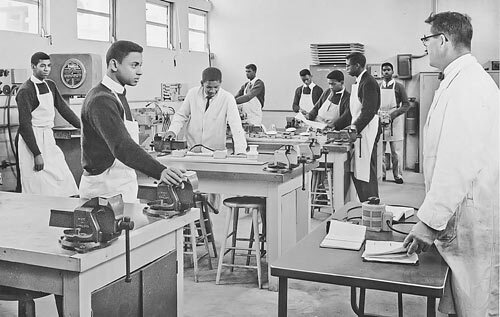 The students, from left to right, have been identified as Alfred Eve, Ralph Simons, Michael Dowling (in the lab coat), Victor Thompson, Triscott Scott, Royston Trott, Hilgrove Trott (or possibly Pierce Smith) and finally Larry Dixon. Tyrone Williams said that the students were from the class ahead of him, which dates the photo 1961/62. We are still celebrating the Bermuda College’s 40th Anniversary, and this week’s photo shows what happens between classes. Can you help us with the who and when? Contact Gary Foster Skelton at gskelton@bermudasun.bm or 278-1880.